Lately I’ve been having nightmares about robots. Spoilers for the end of the first mission of Call of Duty: Black Ops III follow. It’s strange. I thought it would have been the zombies. My mind’s been fertile soil for the seeds of bad dreams since I was a small child, and over the years I’ve gotten pretty good at predicting when one was going to come. I remember my first nightmare forecast quite vividly—I’d caught the opening of An American Werewolf In London on cable while staying with my father at his girlfriend’s house. I stayed awake as long as I could, because I knew the shredded skin on actor David Naughton’s face would find its way inside my head. It did. My mind never saw the robots in Call of Duty: Black Ops III coming. I’ve always loved science fiction; always loved robots. They were safe and clean and helpful. Even the evil ones, like Maximilian from Disney’s The Black Hole, were too cool to fear. 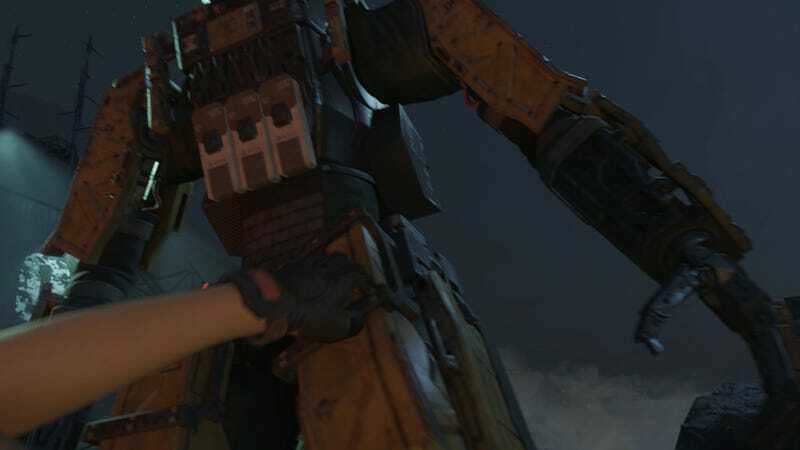 But Black Ops III’s robots are not cool. They are cold military metal, relentless and, at least in the first chapter of the game, unstoppable. They are introduced as something to be feared, and while later on (with one notable exception) they become nothing more than cannon fodder, I did briefly fear them, and that brief moment was enough to plant those nightmare seeds. It’s dark. I’m on the ground. A machine with arms and legs and lights for eyes bears down on me. I try to scream, but no sound comes—a nightmare trope my brain commonly employs, perhaps because I pride myself on my ability to talk my way out of sticky situations. There’s no talking as the metal fists rain down. I hear my bones breaking, feel my organs rupturing. I wake up. The nightmare is pretty much a replay, which to be fair happens a lot when you play a game often enough. It’s like closing my eyes and seeing Tetris blocks falling, the science fiction horror edition. Here’s the scene from the game. My character (I’m playing female) has just gone through hell trying to rescue a prisoner from a vast military compound. Evac is moments away. I think what frightens me about the scene—why my mind latched on to this rather than the rampaging undead from Zombies or Nightmares game modes, is that this is a situation that could happen. Asimov’s Laws of Robotics are lovely, but they’re also fanciful. Humans make machines capable of killing other humans every day. We have machines that walk. Machines that pound steel into different shapes. Machines capable of lifting, crushing and rending with strength far greater than any human could ever muster. And we have machines capable of identifying a target and reacting to perceived threat. And that’s what’s happening in the scene above. She punches. The robot disarms her. She kicks, it removes the threat of her leg. She flails, another arm gone. She screams, it pounds on her until she stops. It’s cold and calculated and unstoppable. I wonder what the robots would have done had Stabler from Law and Order: SVU not shown up at the last minute. I picture the robots marching off into the night without another calculation spared for the body behind them, the person whose blood is drying on their metal digits. I couldn’t say for sure. The scene ends, my nightmare ends, and my character eventually wakes up to find she’s been fitted with the same sort of mechanical appendages that stole her fleshy ones in the first place. Thankfully for her the game’s writers don’t dwell on the trauma too much—she suffers a few flashbacks here and there and then as far as I can tell she’s fine. Good for her. I fear the experience is one I’ll be revisiting for quite some time. Contact the author of this post by relentlessly pursuing him with your tank tread feet, at fahey@kotaku.com or find him on Twitter @bunnyspatial.